← Will Obama get BTU’d by Gore’s Carbon Tax? I’ll say this for so-called “climate scientists” and activists: just when you think they couldn’t possibly come up with a whackier idea (“earthworms cause global warming!”) they prove that, yes, they have even crazier ideas running around in their heads. Here’s the latest: A group of a dozen climate and environmental “scientists” have written to the journal Conservation Letters to urge that we save the polar bear from global warming – by shooting it if necessary. I know, crazy as a loon. But the other options that Desrochers and his chums suggest are if anything even more off-the-wall, special-jacket-with-wraparound-sleeves insane. For example, how about saving polar bears and the planet by shooting seals and then flying them vast distances before dropping them out of helicopters to encourage the bears not to congregate? Derocher said in an email that the goal would be to distribute food, such as seals, in sufficient quantities over large distances so that hungry bears, forced ashore by lack of ice, would not come into conflict by vying for the same food. The goal would be to keep bear populations widely scattered, as attracting too many bears to central locations could increase the risk of disease transmission. Helicopters could be used to deliver the seals, but the logistics and expense of such a plan would be daunting. Thousands of seals would have to be killed by wildlife officials every summer to meet the needs of hungry bears, who each consume up to five seals a week. Yale Environment 360: Will Bold Steps Be Needed to Save Beleaguered Polar Bears? Climate scientists plan to save the Arctic wildlife by shooting it. Another possible measure would be to relocate bears from more southerly regions, such as Hudson Bay, to more northerly regions, such as M’Clintock Channel in Nunavut in the high Canadian Arctic . . . Cubs from one population could also be flown to more northerly regions and placed with females that would rear them as “foster” cubs, Derocher said. 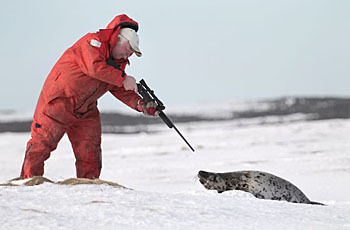 Just like destroying the village to save it, these guys want to save the Arctic wildlife by shooting it. Seals, polar bears, and who knows what else. They have a plan to fight the global warming that isn’t happening. Luckily for this bear, climate scientists saved it before it was killed by global warming. For some reason, I’m imagining the pointy-haired boss from the Dilbert cartoons in a new role as – drumroll, fanfare – Steward of the Planet! it would make about as much sense, wouldn’t it? The same kind of Kafkaesque reasoning. At first I thought this was an April Fool’s joke post… albeit one that mimics real life, ‘eco-friendly takes’. Sadly it’s not. Incidently, the picture is of a Grolar Bear… 1/2 grizzly and 1/2 polar. The bear was confiscated by Canadian officials and the hunter faced a year in jail and a $1000 fine untill DNA proved it was 1/2 polar, for which he had a permit to take. Polar bears don’t just eat seals. A radio collard polar bear was recorded swimming a record nine days straight – 426 miles. Polar bears have survived periods of ice-free Arctic summers during the Holocene. Polar bear numbers are up from 5,000 in the 1950s go over 25,000 today. Hi Jimbo! There was a big die off of polar bears about 1973-4. The reason was a very cold winter. The seals couldn’t breach (sp?) the fast ice and their population dropped 80%. The result was famine and starvation for the local polar bear sub-species… Beaufort Sea, I think. My home town sold 37 polar bear hides in 2010… shot by natives around James Bay. Permits are issued based on official Government bear population numbers. I believe the current polar bear license issuance is 38 – mostly to Inuit who often let someone else do the actual hunt – for big dollars – but the Inuit gets the hide. They’re auctioned mostly in North Bay annual fur auction but they make their way to many other Canadian outlets for sale.